Social Media is a huge deal these days. No wonder, even B2B businesses are looking to generate leads through social media. We know, social media channels like Facebook and Instagram are infamous for “I-am-vacationing-in-Hawaii” kind of posts. But don’t let this make you forget that you can indeed generate leads through social media. Still skeptical about lead generation through social media? Today, we will discuss some of the most effective social media lead generation strategies. It is no mystery that social media helps you to engage with your leads personally and directly. But who will you engage with? Social media consists of millions and millions of people. Surely, not everyone is your lead. So, before you start your actual social media lead generation process, you have to identify your target audience. Identifying the target audience is a necessity when it comes to lead generation through social media or any other medium for that matter. For example, you have to discern whether your target audience consists of millennials or let’s say, whether you need to target small-sized companies or medium-sized companies and so on and so forth. Moreover, before identifying your target audience you also need to discern on which social media platform you are likely to find your target audience. 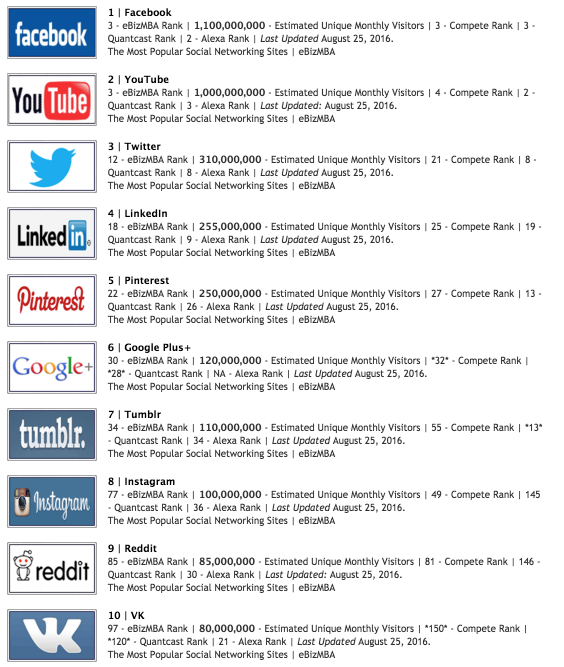 Here are the top ten social media platforms in the word. You should be aware of the fact that every social media channel contains different strata of society. For example, if your target audience consists of college going teens, then you are likely to find success with social media platforms like Instagram, Pinterest, Tumblr and more. So, brush up your research skills and make an ideal customer profile and then hunt for your target audience. Now you know where your target audience is. But the next step is to get in touch with them. Let’s forget for a moment that we are discussing lead generation through social media. How do you generally generate leads? By engaging your prospects through email? Or maybe by cold-calling? You get in touch with them and send in your sales pitch. But hang on… Why would anyone care about your sales pitch? Aren’t you overlooking the “engagement” part? Being able to engage your audience directly is actually a staple in social media lead generation process. Even most successful brands engage their prospects on social media. 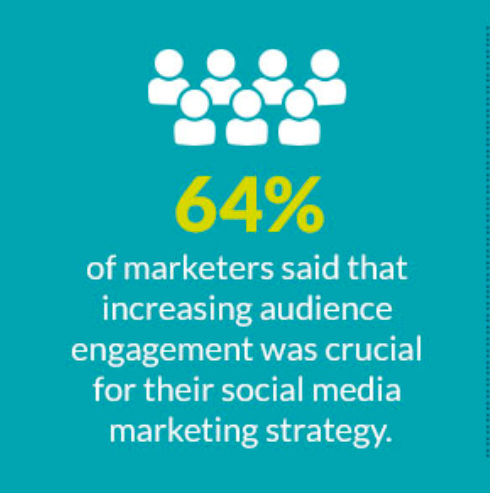 This is the reason why 64% of marketers feel that customer engagement is crucial for their social media marketing strategy. Let me give you my firsthand experience with social media engagement. 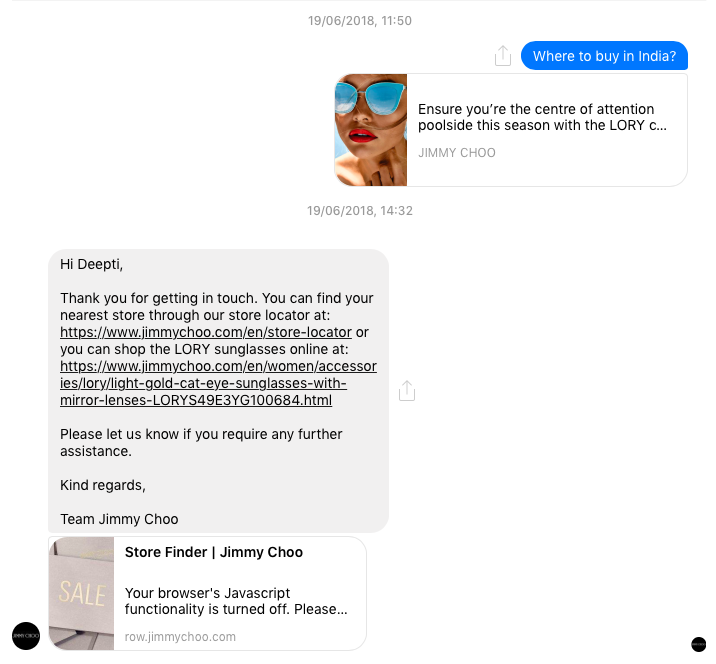 I recently, sent a messaged Jimmy Choo through Facebook trying to resolve a query regarding their product. It probably took them a couple of seconds to form a response, but now they successfully acquired a lead in me. 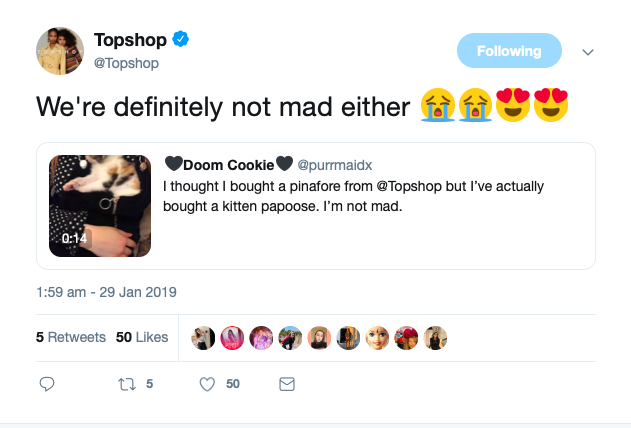 Apart from this, don’t forget that your prospect engagement should continue even when the lead makes the final purchase. Social media engagement tells a lot about your brand. Therefore, make your social media lead generation process a bit more personal and engaging. Gated content is one of the easiest strategies to generate leads through social media. Once you are done creating a rocking content, there’s not much you need to do further. First things first, what is gated content? Gated content is basically the type of content which is unavailable to the audience until they complete an action. This stop barrier is not permanent. Once your audience performs an action you want, say, for example, enter their email, they get access to your content. Now, gated content is only ideal when the content you are offering is either valuable or hugely excellent. You have to make sure that your title and description is enough for them to want to access your content. If you are posting something frivolous, no one will even click on the link. 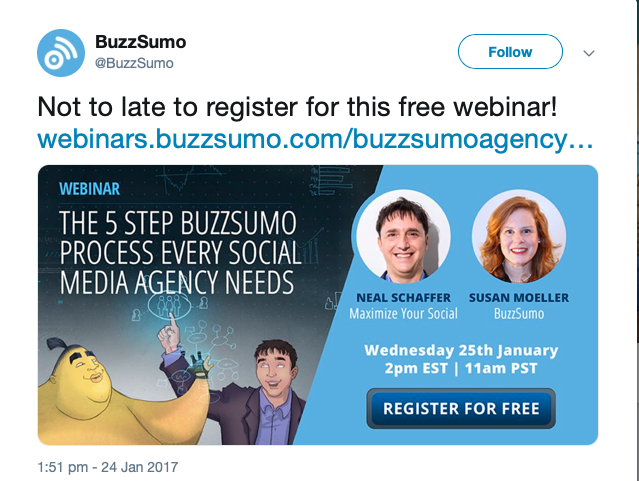 For example, here’s one of the tweets by BuzzSumo on their Twitter from 2017. You could only access their Seminar after registering which entailed entering your contact information. The key is to figure out what type of content your audience will prefer the most. Secondly, gated content has to be promoted and shared in such a way that it doesn’t come across as spam-y or particularly promotional. I am sure you know how hugely popular live streaming videos are these days. According to Wordstream, Social video generates 12 times more shares than text and images combined. The best part is that people don’t have to read tons of text to discern your motive. Live streams are decidedly shorter in time and people are able to connect better with something that goes on Live. 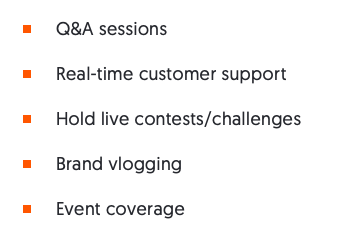 Okay, so you must be thinking that how the heck will you incorporate live streaming videos in your regular social media lead generation process. The truth is that you can use them for just about everything – from your product demonstration to some quick tips for your prospects. There’s a whole lot of potential when it comes to lead generation through social media. The best part is that it is less of a headache than say, cold-calling. If you are grappling with your social media lead generation process, then try out the aforementioned tips. Moreover, the reason why we put stress on these strategies is that they are highly flexible. You can get as creative as you want and use them for various purposes. Do you think that lead generation through social media is easy as compared to other mediums?